BOSTON (AP) — Rallies at federal immigration offices across the country Wednesday called for the release of Eduardo Samaniego, an immigration activist from Massachusetts facing deportation. 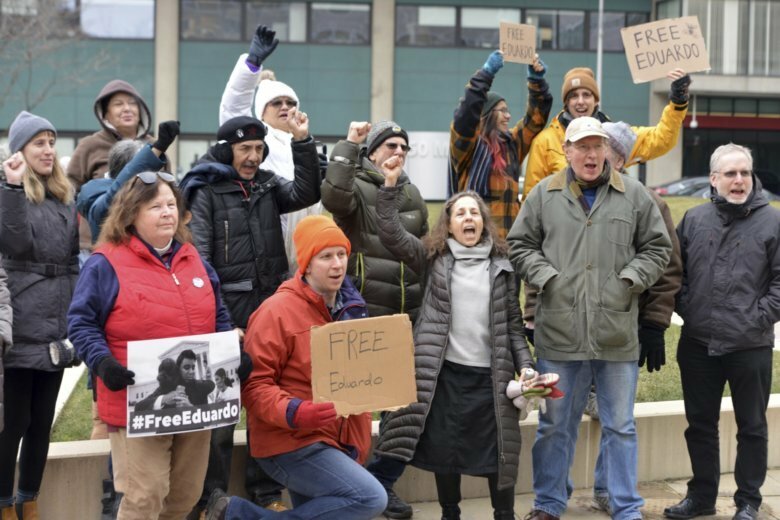 In New York City, Los Angles, Boston, Springfield, Massachusetts, and Hartford, Connecticut, small crowds of supporters held signs saying “Free Eduardo Now” and chanted and banged drums as they delivered petitions to officials at the federal offices. A prayer vigil is planned Thursday in Atlanta outside the immigration court where the 26-year old native of Mexico’s fate may be decided. Samaniego has been in federal custody since October, when he was arrested for failing to pay a $27 taxi fare in a suburb of Atlanta and found to have overstayed his visa. He had been a prominent voice at immigration rallies and marches in Massachusetts in recent years, sharing his experience as a college student without proper legal documents. Last year, Samaniego marched 250 miles (402 kilometers) from New York to Washington, D.C., with 10 others to call for passage of the DREAM Act, federal legislation that would have protected certain young immigrants living in the country illegally from deportation. During his arrest in October, Samaniego told police he’d gone for a long run without his phone or wallet and had hopped in the cab because he didn’t know how to get home, according to the police report. He told officers he’d moved from Massachusetts about five weeks prior. Prosecutors ultimately declined to pursue charges after Samaniego paid the fare, according to court records. But Samaniego still faces deportation because he overstayed a six-month tourist visa granted in 2009, said his lawyer, Hiba Ghalib. Supporters, led by the Pioneer Valley Workers Center, complain Samaniego is being targeted because of his advocacy. They say his deportation is being “fast-tracked” and that he’s been placed in solitary confinement and subjected to harassment and abuse during his detention. His mother said the experience has exacerbated the post-traumatic stress, depression and anxiety he’s struggled with since a 2015 natural gas explosion left him badly burned. Officials at the Irwin County Detention Facility in Ocilla, Georgia, where Samaniego has been held in recent weeks, didn’t respond to emails seeking comment. In court Thursday, Ghalib says she’ll seek a special hearing to consider her client’s competency. He is being transferred to a psychiatric hospital in Colombia, South Carolina, this week, she said. A judge last month denied Samaniego’s request to be released until his immigration case is decided.